Can a Tram Station be the Heart of a University? Every semester thousands of new students begin their studies at universities all over Germany. Usually they just left school, a safe and caring place compared with university. While at school you knew every teacher and had about 1000 other pupils with you there, university is another world. Here over 20.000 students are going in and out, coming from all over the world, studying different subjects and pursuing different goals. Quickly human beings becoming numbers. All that the teachers need from you is your student number. Who you are, why you are there, that's mostly irrelevant. That's why even a trivial thing like a tram station can become something central and important. Something, that gives you orientation, if you get lost again in the big campus area. The station is something everyone knows. Where you can meet each other without the fear of getting lost. It is a place where every now and then people meet by accident. People you haven't seen for a long time or only barely know. The station is something that is always there, something that you can rely on. 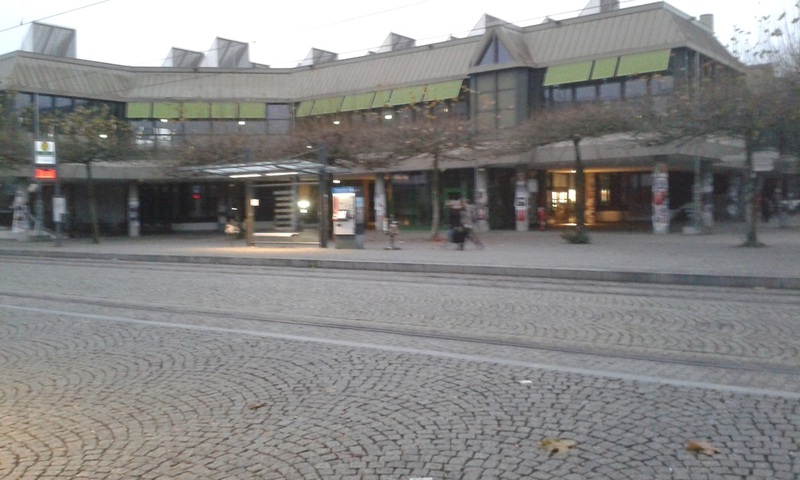 In the morning your university day starts by stepping out of the tram. And in the evening, when you're standing at the station and waiting for the tram, you know the university day is over and your leisure is about to start. But as time goes by you will get used to your "new life", find your way and get to know more and more people. So in the end the tram station won't be your only safe place in the unknown. But it will still be a part of your everyday routine.